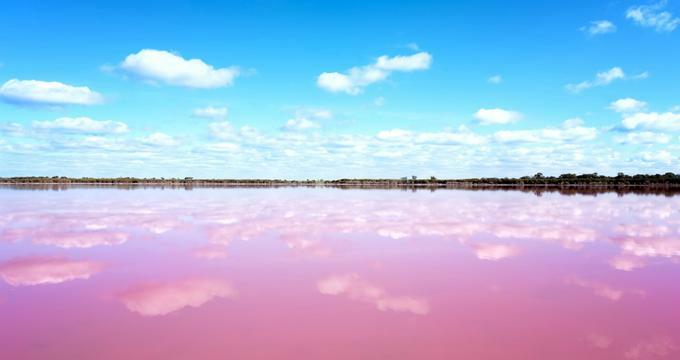 Located in Western Australia's Golden Outback near the town of Esperance, Lake Hillier is often referred to by the more affectionate label of Pink Lake due to a high concentration of algae in the water; its bubblegum-pink hue is something that has to be seen to be believed. This incredibly unique sight makes its home around Middle Island, the largest of the islands that comprise the Recherché Archipelago, around 70 miles from Esperance. The island is accessible by a short boat tour, or the gorgeous Pink Lake can be taken in rather spectacularly via a scenic flight. If you do decide to keep your feet on terra firma and visit the island properly, you can continue the aquatic adventure by taking part in one of the many diving and snorkeling classes arranged offshore from the Esperance jetty. Cruises also leave Esperance early in the morning and return at dusk, allowing you to visit the lake up close. The lake was first observed by Matthew Flinders in 1802 after he ascended the island’s highest peak, now known as Flinders Peak. He noted the lake’s striking hue but also identified it as a good source to easily harvest the plentiful quantities of salt crystallized on the shores. It is said that Flinders named the lake for William Hillier, a crew member of the Investigator who had died on the island in 1803. In 1889, Edward Andrews looked into the commercial possibility of procuring Lake Hillier’s salt. He moved onto Middle Island with his sons, but they only ended up working the deposits for around one year. The lake underwent further salt mining in the 19th century; however, the enterprise failed due to the small issue of the salt collected being too toxic for human consumption. The lake now belongs to the Recherché Archipelago Nature Reserve and features on a walking trail through the area that takes in its shoreline. Only a few living organisms inhabit the lake itself, among them the various algae and other microorganisms that give the water its unique hue. While it may look odd, the water of the lake has no known negative effect on humans, although, as mentioned, you shouldn’t eat the many salt crust deposits that cover the shoreline. The lake is saline with salt levels comparable to those of the Dead Sea and is perfectly safe for swimming. The salt provides bathers with extra buoyancy and many advocate the health benefits of soaking in saline lakes. With so much going for it, many a visitor couldn’t be blamed for wanting to take a dip; visitors should bear in mind that aside from the cruises there aren’t many easily accessible ways to get there. However, if you do make the journey, you can enjoy not only the lake but also the beautiful surrounding forest areas.